Lisburn and Castlereagh City Council has been forced to shelve controversial plans for a new car park ticketing system amid confusion over whether the scheme was actually ever approved by councillors. On Friday afternoon the council issued a press release advising the public that the new ticketing system was to be introduced at eight council-run pay and display car parks from January 21. But just a few hours later it retracted the statement and accompanying photograph, insisting that it was “not ready for publication”. The new system would have involved the installation of updated parking meters with alpha-numeric keypads, and drivers would have been required to input their vehicle registration number when paying for their parking space. Parking tariffs were to remain the same. Despite the council recalling its press release, news of the new system appeared on social media on Friday and was met with an angry reaction from members of the public. Some drivers branded the scheme “a waste of time and money”, while others accused the council of trying to prevent drivers who are leaving car parks and have time left on their tickets from handing them over to other motorists. Others warned that the new system would harm local businesses, putting shoppers off visiting the city centre. 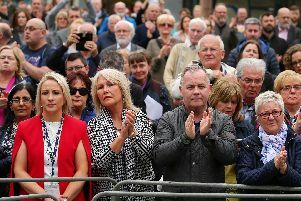 UUP councillor Nicholas Trimble said he first heard about the scheme from a council Facebook post on Friday, and immediately called for it to be suspended pending full discussion at council. “Myself and the Ulster Unionist Party group on the council are opposed to this proposed scheme as I cannot see how it benefits the public in any measurable way. Furthermore, at a time when we are trying to encourage increased footfall in the town centre to support our local businesses, these proposed changes would only drive people further away,” he said. Stressing that members of his party also called for the scheme to be suspended, Alderman James Tinsley, leader of the council’s DUP group and vice-chair of the Environmental Services Committee, said: “We were led to believe that it had all been agreed through the council’s overall car parking strategy, but officers are now trying to establish if it was actually approved or just noted. Asked why the council is considering implementing the changes, Mr Tinsley said they are bringing their ticketing system “into line with what other councils are doing”. Confirming that the project has been shelved, a council spokesperson said: “Planned changes to ticketing at council-operated car parks, due to come into operation on Monday January 21, have now been delayed following a number of concerns expressed by elected members and further discussion will now take place at the relevant council committee.